Tagged bat and white nose syndrome. 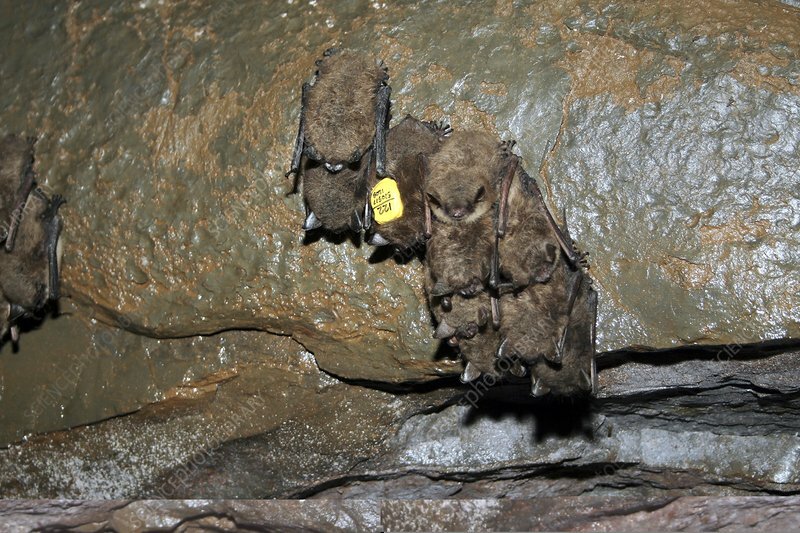 Group of bats hibernating in a cave, one with an attached datalogger (yellow) and one with white nose syndrome (WNS). WNS is a deadly infection with the fungus Geomyces destructans, leading to white fungal growths on the nose and wing membranes. It was first identified in New York, USA, in February 2006, and has since spread throughout the north-eastern USA and beyond. Populations of little brown bats (Myotis lucifugus) have been severely affected, and other bat species are also threatened. Photographed by the Pennsylvania Game Commission in Shindle Iron Mine, Pennsylvania, USA.